Acadia Cafe – Minneapolis | Season It Already! Posted on November 8, 2012 by Carrie @ Season It Already! Last night we went to a concert at the 400 Bar in Minneapolis. If you haven’t heard of Shovels and Rope, you need to check them out! We’ve been listening to their music ever since we heard them on 89.3 The Current. I was more excited to go to this concert than I have been to see one in a long time! They didn’t disappoint. 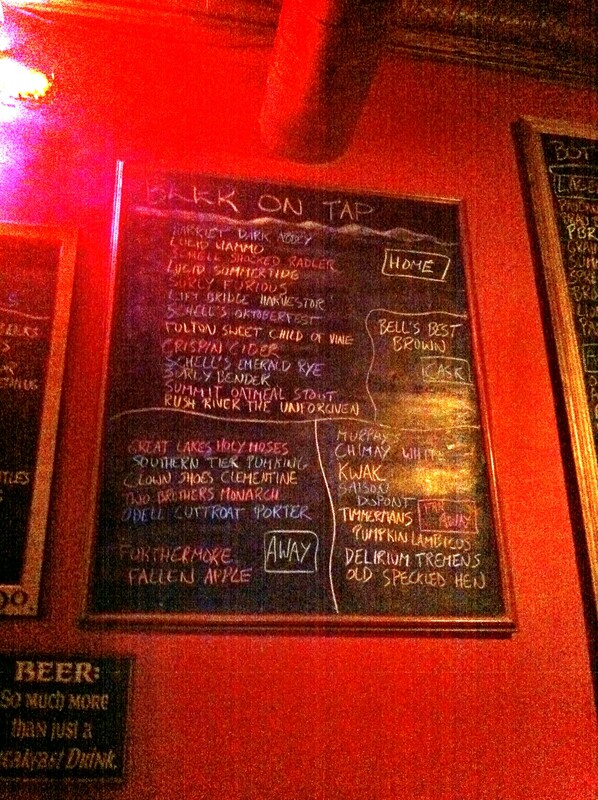 In any case, a friend of ours recommended that we have a couple of drinks and/or dinner at the Acadia Cafe beforehand. It’s just kitty-corner from the 400 bar, so we could park once and walk over. As a beer snob, this appeals to me. The have a large selection of bottled beers, too. We ordered a round of Pumpking Ales by Southern Tier, because it is one of those beers that when you find it on tap, You Must Have It. Our local liquor store sold out of it by the bottle well before mid-October. So this was a treat. They were pretty good! I liked the “spices”, but couldn’t quite place what they were. No matter. I wouldn’t be screaming, “Season It Already!” here. 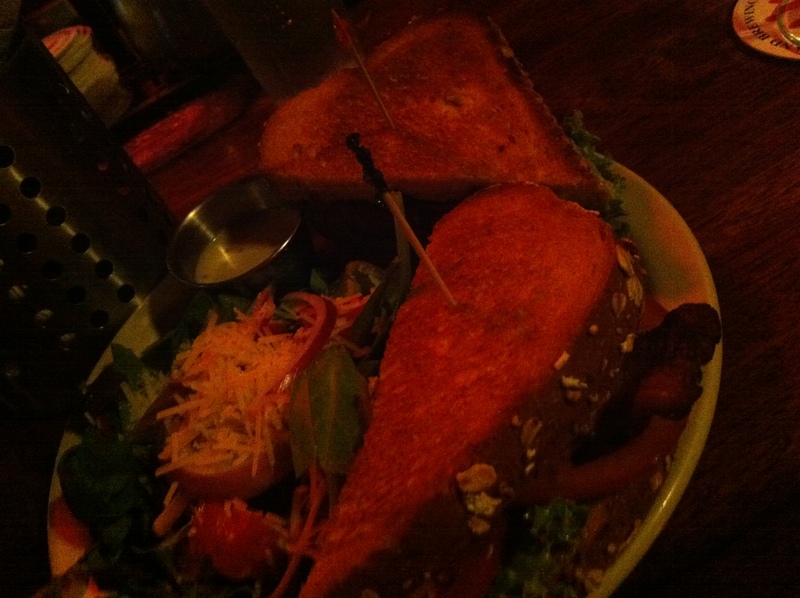 The Acadia Grilled Cheese – “A yummy combo of garlic and cheese. We spread our house-made aioli on toasted multi-grain and melt three cheeses – cheddar, Swiss & parmesan – with fresh tomato.” $6.35 or add bacon for $1. I took more than a bite. 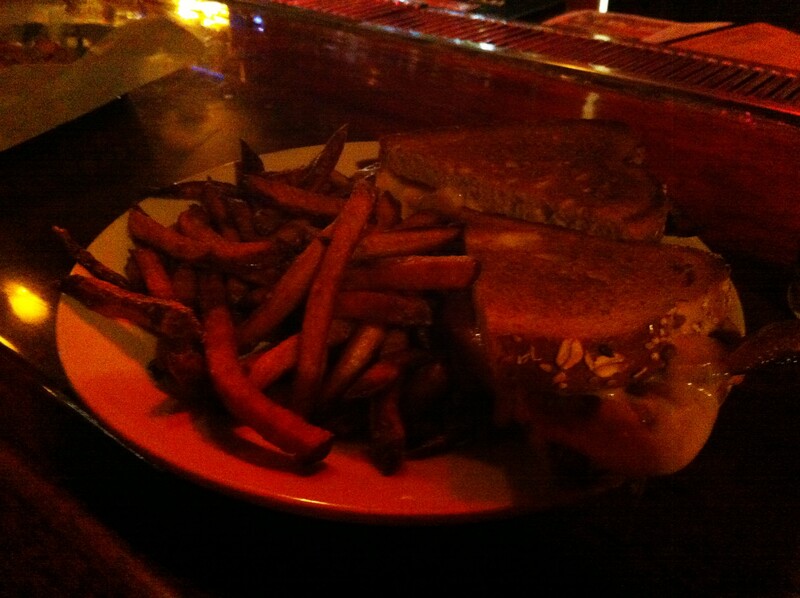 This was pretty good as far as grilled cheese goes. It seemed only one side was toasted though. I could have done without the bacon Rob ordered and he could have done without the tomato. I love the clever name of this sandwich! But that isn’t what made me order it. It was The Guac. And I was underwhelmed. I could barely taste it… until I took the sandwich apart and took a bite of just the bread. The multi-grain sandwich bread they use here is pretty good, though. The side salad I ordered instead of fries wasn’t a show-stopper, but better than your average iceberg lettuce salad. What I loved about the ambiance of this place was that it really reminded me of an artsy café, where you’d get a cup of coffee. It was a little dark inside and the clientele was a bit alternative and eclectic. I like that. I also like the fact that unlike many bars that serve this number of tap beers is that there are NO TVs! Sure, as a Packer fan, it’s obvious that I do like watching sports from time to time. However, sometimes I’d just like a little conversation when I’m out with my husband. Sometimes, I’d rather he not be staring at a TV screen all night, ya know? Acadia Cafe has it’s own line-up of live music and DJs as well as nightly specials. For example, right now Mondays are 2-for-1 bottles of beer or half-priced bottle of wine night. We will be back… to try different food, to sample more craft brews and to enjoy the ambience. 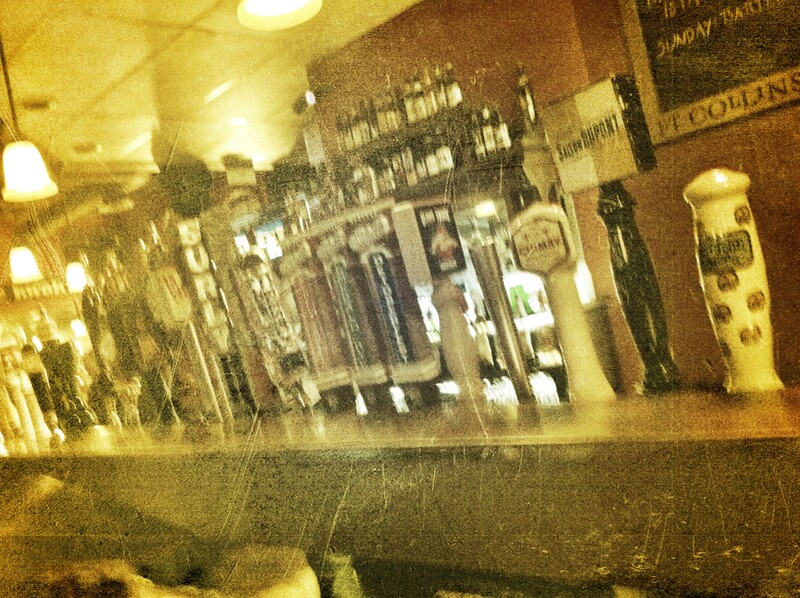 What’s more, is when we crossed the street to the 400 Bar, we expected to encounter CRAP ON TAP. But such was not the case. They had a few good brews over there, too. Not too shabby of a night if you ask me! Do you have a favorite neighborhood café? If so, what makes it unique? Oh! You just reminded me of a vegetarian one I love in Green Bay! it’s been ages since I’ve been there. I need to go back again when I visit my folks. Both sandwiches sound good. I had to laugh about the hubs ten worst fries list 😉 I’m not much of a beer drinker but, sometimes it sounds good and I’ll try some of my husband’s. 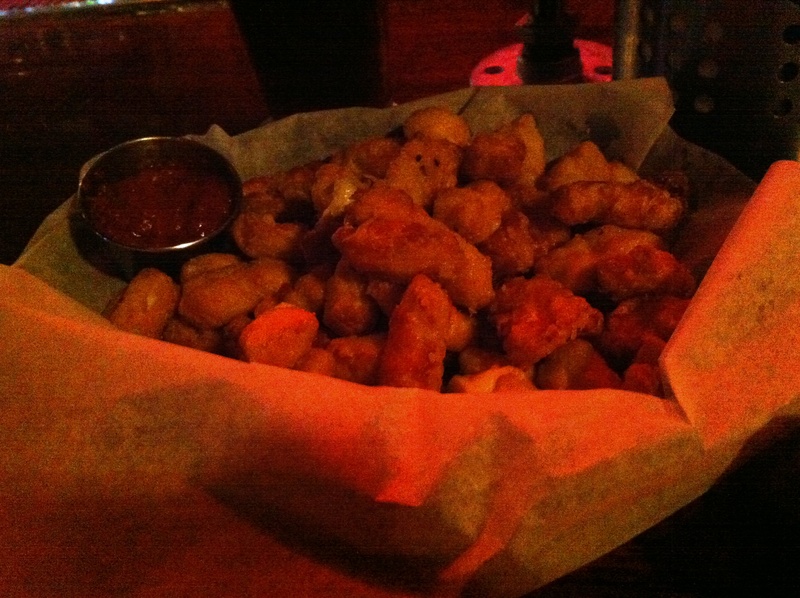 I like Killian’s…a lot! He doesn’t try to many different ones though. I go for the margaritas and sangrias myself 🙂 A place without tv’s, I would love. Whenever we go to Applebee’s he is staring at the screen and whatever sport is on, it would be nice to not have that option. Suzie-I think this place is a win-win for us! Do you Yelp? If not, it’s a great way to give a shout-out to your local. I’ve recently started being more diligent about the process and am surprised at how often I do visit certain spots. All those beers on tap! Love. Sadly, if my husband and I go to a place that has like 300 beers on tap? He’ll still order a Miller Lite! We live in the “sticks” so no local cafes here – I need to hit up Chicago with my daughter though soon! I’m not a fan of beer, but I LOVE a good pumpkin ale! Pingback: World Run Day – A “Race” Recap « Season It Already! Pingback: Foodie Penpal from the South | Season It Already! Pingback: I Took a Walk… | Season It Already!